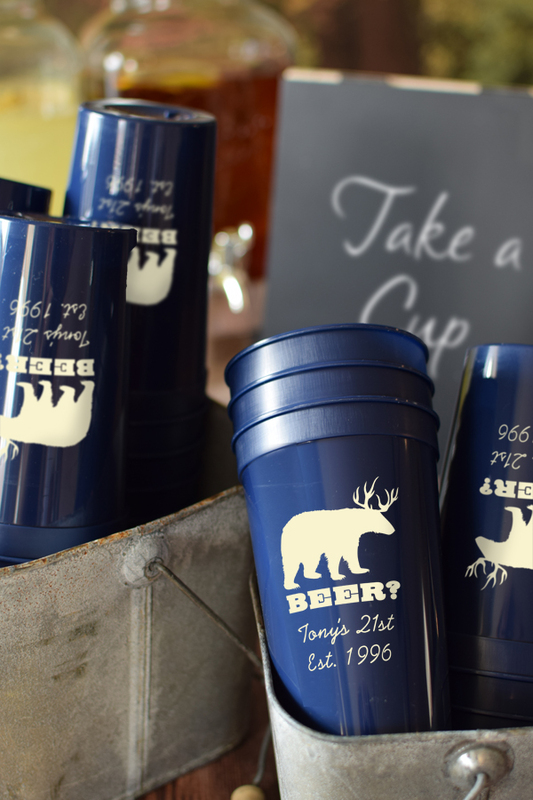 A great size for outdoor parties, destination events, and for serving beer, celebrate your adult birthday with custom printed, reusable 22 oz plastic stadium cups. Perfect for sending guests home with party souvenirs. Personalize the front and back of your cups for no additional charge. 22 ounce stadium cups are available in 8 cup colors and are top-rack dishwasher safe. Personalized with an adult birthday design and your own custom message. A larger cup that is great for holding beer or soda, each cup measures 5 3/4 inches tall by 3 1/2 inches in diameter. 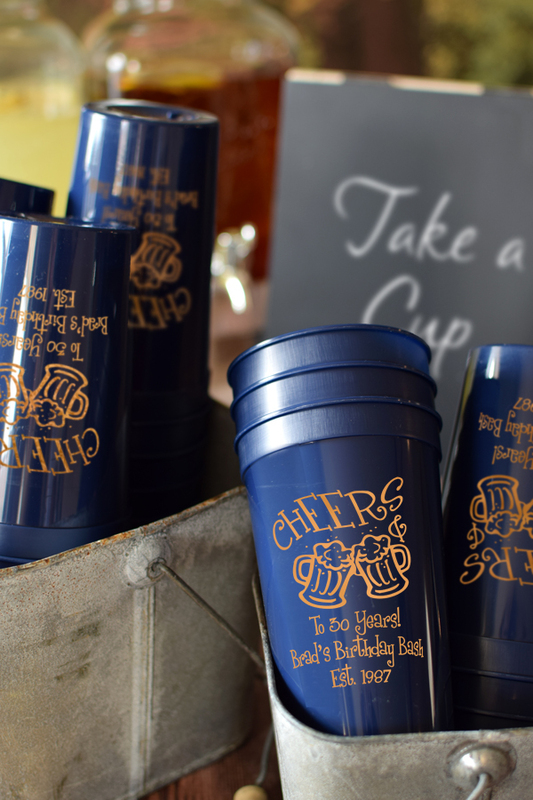 A great size for outdoor parties, destination events, and for serving beer, celebrate your adult birthday with custom printed, reusable 22 oz plastic stadium cups. Cups looked amazing. Can’t wait to use them in few months. I ordered and personalized cups for vacation and everyone loved them. Customer service was great and responded in a timely manner to my questions and when the lids were not shipped with the cups they shipped them overnight so we would have them for our vacation. I will be ordering again from TippyToad. Thank you! We have used Tippy Toad for all of our son's first birthday parties and LOVE them. They are great quality and the customer service is wonderful. I love that they will send you a preview of your design before you actually order it. We also waited til the last minute to get our order in and Tippy Toad did everything they could to get our order here on time! Would highly recommend them!!! my order was perfect and also received a day early. Thanks so much. First time order with the company and blown away with their customer service, product quality, fast delivery. I will recommend this company to everybody that will plan a party from now on. Thanks for everything. I am so glad I ordered these as favors for the birthday party. They were a hit with the guests. Such great quality! The Black with Blue ink were the exact color we were going for! Love the cups we ordered. Navy with gold writing...beautiful combination and perfect for a 50th bday! Great product, came as advertised. Bought them for my wife's 40th birthday weekend. Everyone liked them. Cups came quickly and cuter than the pictures! Mary was amazing to work with! She patiently worked with me until every detail was perfect!!!! The cups were a wonderful value and a quality product. The cups were a great hit at my mom's birthday party! Great customer service and great quality! The cups arrived quickly and Mary was a pleasure to work with. Would definitely order these cup favors again! I couldn't have asked for anything better. My cups arrived early and were perfect for my 30th birthday celebration. All attendees loved their party favor! Great customer service and fast delivery!!!!!! Perfect addition to my party. They were great! Everyone at the party loved them! These cups are so cute and affordable and practical! They really add that special touch to the event! Arrived more than on time and were absolutely perfect and as expected! 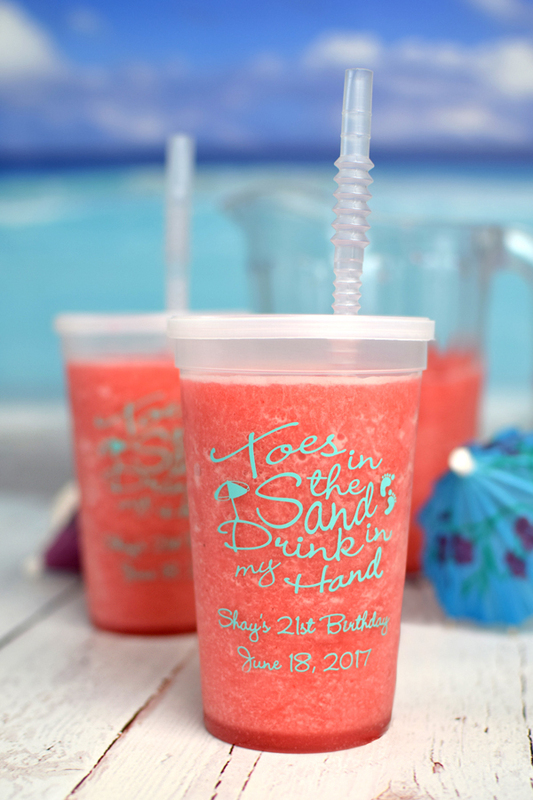 These cups were perfect as my party favor! I loved the ability to request a "proof" before purchasing. The easy navigation and level of customer service was unmatched. I will definitely order again and refer others to this website. I love these cups. I bought them for my husband's 40th birthday party. I did the whole order online and gave myself a lot of time before the party just in case. They came really fast, and ordering was a breeze. I love the product. I can't wait to use them at the party. My only recommendation would be the company have more clipart options. I wish there had been a few more to choose from. And maybe there could have been had I called but I did it late at night online. The personalized cups were a big hit for my brother in laws 50th. Came Quickly and were high quality.